While we’re never one to turn down a good glass of red, its rare to see it in a cocktail – and even more so to see it mixed with bourbon. But that’s just what The Moxie does. This daring whiskey-meets-wine cocktail was invented as part of the collaboration between Bardstown Bourbon Company (BBCo) and Phifer Pavitt Winery. BBCo recently announced the first whiskey in their Collaborative Series – a nine year old Tennessee Bourbon finished in Phifer Pavitt’s Date Night Cabernet Sauvignon Barrels. When the team at Bottle & Bond Kitchen and Bar got a hold of the new bottle of whiskey, they saw it as much more than something to sip neat. Phifer Pavitt Reserve is more than a marriage of the flavors between whiskey and wine – its a true collaborative effort between the two companies. The story behind the Date Night Cabernet makes this cocktail even sweeter. Suzanne and Shane, owners of Phifer Pavitt Winery, named their Cabernet after the date nights they planned while living in different cities. Date Nights were a time for important discussions – career changes, starting a family, and of course, getting into the wine business – so its fitting that the first Phifer Pavitt wines would use that label. 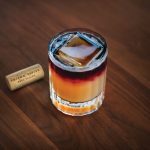 “The Moxie Cocktail is a fantastic way to showcase both the Phifer Pavitt Collaboration Bourbon and Cabernet. The Cabernet accents the currant and dark fruit notes of the finished bourbon while the lemon juice provides a nice pop, smoothed out by the simple syrup. It’s a fun cocktail for entertaining and a celebration of both wine and bourbon,” says Daniel Callaway, Director of Bourbon Education, Guest Experience, and Product Development at BBCo. With so many love stories (BBCo and Phifer Pavitt, Shane and Suzanne, and whiskey and wine) inside just one cocktail, we can’t think of better mixed drink to make today. Recipe below! The post Bourbon and Wine Make this Cocktail Your Perfect Valentine appeared first on The Bourbon Review.